It has been suggested by historians that a theory or a historical point of view has truly “arrived” when one begins to see revisionism rear its head. 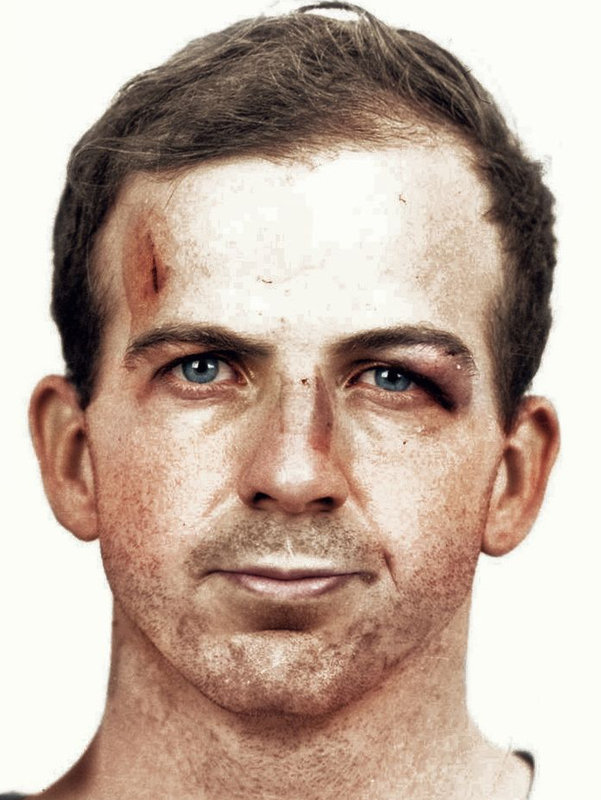 I was neither expecting nor waiting for that to happen with my research into “The Raleigh Call” event from the JFK Assassination — but it nevertheless has begun. Break out the champagne! There are so many errors involved with and implied by that one sentence that it stopped me dead in my tracks. Let me explain what I mean by that. Based on that one sentence, if this is what the author means when he says “The Raleigh Call did not happen,” then I and 100% of everyone who was involved with or who investigated the Raleigh Call agree with him completely. That which he claims never happened — as specifically voiced in that sentence — in truth never happened. And so I join him in supporting the obvious. It will be interesting to go through the entire article to see if that is really what he meant to say. Let me interject at this point that I am always pleased when I see that others have written about The Raleigh Call, and many have. Some have been laughably ridiculous and/or horribly inaccurate, while some have been thoughtful, relevant, fact-based, and helpful to the overall investigation. I have read them all, but my level of interest in them is always in direct proportion to their level of scholarship. This latest author is, like everyone, entitled to draw his own conclusions about what happened that night in the Dallas jail. If any researcher takes all the facts as we know them (or, better yet, finds new facts! ), and comes to a different conclusion than I do — based entirely on the facts, mind you — then I will honor and respect his/her intellect and scholarship, and I will say so publicly. But if that researcher plays fast and loose with the facts, then I frankly have neither respect nor time for it. That sort of thing gives all JFK researchers a bad name. At this point, I do not know into which category this new article falls, but that first sentence (see above) does not fill me with great hope. In the interest of fairness and balance, here are links to the new revisionist article “The Raleigh Call Did Not Happen” and to my monograph The Raleigh Call and the Fingerprints of Intelligence. If by this time you are asking yourself, what in the world is/was The Raleigh Call, here’s an abbreviated, “just-the-facts-ma’am” version. Had Mrs. Treon not kept the LD call slip that she filled out as a souvenir, this story would be no more than the most minor of footnotes in the tragedy of the Kennedy Assassination. 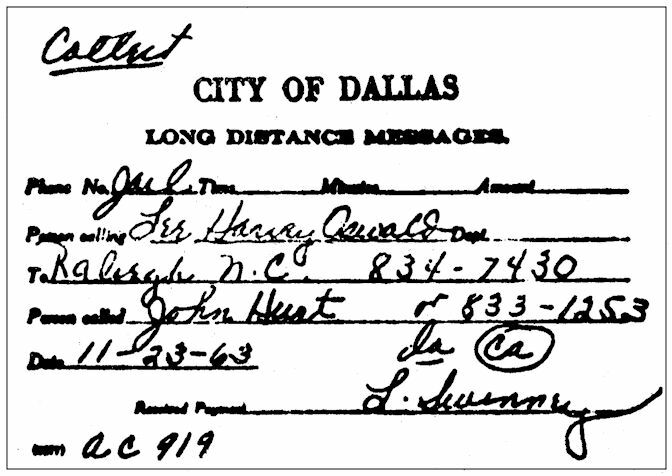 However, years later, when the identity became known of the man to whom Oswald was trying to place a call, its significance would rise to the “very troublesome” and “deeply disturbing” levels ascribed to it by HSCA Chief Counsel Robert Blakey. As part of my second career (late ’70s to early ’80s), I lived in Hartford, Connecticut, where I was the General Manager of a professional chamber orchestra. And being only about 90 minutes away, I went as often as I could up to Tanglewood to absorb the incomparable music amid the glorious Berkshire surroundings. My friend frantically begged me not to “risk my heart” by changing the tire; “You could die!” she almost yelled. (Bless her heart. 😀 Did she major in Histrionics at Opera School?) But I forged ahead. By this time the parking lot had emptied, and it was quite dark. A car traveling on Interlaken Road slowed down, saw our obvious dilemma, and pulled in. The driver got out, and the usual sort of “Having trouble?” / “Yes, flat tire” conversation ensued. My friend practically flew over to the man and begged him to help, as I had a “serious heart condition” and shouldn’t be doing such heavy work! I said something like, “The only condition I have relevant to this situation is that I’ve never changed a tire before!” The man gave us a truly engaging (and comforting) smile, and he immediately set to the repair task at hand. In what seemed like record time, he had the car and us good to go. I stuck out my hand, identified myself, introduced my friend, and thanked him profusely and repeatedly for his help. We again witnessed his smile, this time self-deprecating, as he shook my hand. In a millisecond, my mind raced through a million thoughts: Frager. Malcolm Frager(!) Concert pianist. A brilliant musician. Changing my tire!! HANDS! I’ve ruined his career! Oh NO!! His third smile was the charmer. He assured us that he routinely did all sorts of normal things with his hands besides playing the piano, and that he (and they) were no worse the wear for having changed my tire. As it turns out, Frager and his family lived in the nearby town of Lenox, and he was returning home that evening from (as I remember it) a trip to the grocery store. It was a good reminder and object lesson that even famous people like Frager are human, need to buy groceries, and (in his case) can be extraordinarily and humbly giving, caring people. Watch the excellent short documentary (below) to learn more about this great man, who (at age 56) was taken from us too early. Oh yes, and there is considerable conversation in this film, particularly in the beginning, about his hands — the hands that changed my … tire!! Adrianne asked me this morning to please put some music on the stereo. (That’s like asking me to breathe — or to enjoy chocolate!) I think she felt music would lighten her load and boost her energy level on this preparation day. I perused through many possibilities in my CD collection, and I decided to begin with one of our dearest and most beloved pieces — The Moldau by Smetana. That piece not only brought our trip to Prague immediately to mind (the most beautiful city I have ever visited), but it also it took me back to the days when I was working at the University, and would periodically be asked to teach a course in Music Appreciation. The Moldau was probably my favorite piece of Western classical music to teach, as it allowed the students to just sit back and (mentally) watch the unfolding story being told by the symphonic tone poem. It is a musical (totally instrumental; no words) journey down the Vltava (Moldau) River in what is now the Czech Republic. Here is your itinerary for the Moldau River Cruise, giving the timings at which each event takes place in the music. At the bottom of this post, I have placed a link to my favorite recording of the work, performed by the Cleveland Orchestra conducted by the immortal George Szell. By all means, click below and have fun! [0:00] The piece begins by showing us how the river is formed from the waters of two springs, and the music lets you “see” the intertwining of the streams. [1:08] The Moldau grows into a mighty river, represented by a popular Eastern European folk song (which lives today as Hatikvah (“The Hope”), the national anthem of the State of Israel). [3:01] On the journey down the river, we spot hunters (with their hunting horns) on one of the banks. [3:58] Farther down the river, we spot the festivities of a village wedding, where they are joyously dancing a polka. [5:40] The river next passes through a mysterious gorge with appropriately contemplative music. It is a place said to be populated by water nymphs who come out at night to bathe. [8:20] The speed of the river (and therefore the music) gradually begins to pick up. And suddenly, dramatically things get fierce as we navigate through the treacherous St. John’s Rapids. [10:45] Finally we reach Prague, the capital city. As we pass the ancient and stately Vyšehrad Castle, the music returns to the river’s theme, an appropriately grand and uplifting finale. [12:05] We leave the river to remain in Prague, and the piece ends with us watching the Moldau flow farther and farther into the distance. Vyšehrad Castle, Prague, spectacularly seen from the Vltava (Moldau) River. A great musical journey for under 13 minutes, don’t you think?? For many of my students, it was thanks in large part to The Moldau that “classical” music ceased to be something foreign, obscure, dull, and objectionable — and became fun, alive, easily understandable, exciting to listen to, and just plain beautiful. I loved watching that epiphany! So, all morning I’ve been playing for Adrianne many of the pieces I used to teach in that course. Today would have been my father’s 101st birthday. In thinking back about all the time I had with him (as well as the time I failed to have because he died well before “his time”), many memories have flooded back. And one of the ones I’ve had chugging through my brain and heart the last few weeks was remembering what Daddy said he wanted to do once he retired. Daddy said (and after his death, Mother confirmed it) that when he retired, what he thought he would have a great deal of fun doing would be serving as Conductor of the Pullen Park Train in Raleigh. I don’t know if this was just a “wouldn’t it be fun to” kind of wish, or whether he did any kind of follow-up to see what might be involved to make that wish come true. But it seems clear that the Park, the train, the kids and families, and the whole beautiful ambiance of the location appealed to him greatly. Unfortunately, Daddy died at age 64, and his final years were marred by the disease that eventually took his life. So nothing was ever able to come of his wonderfully lovely retirement dream. If you are not familiar with it, Pullen Park was founded in 1887 and was the first public park in North Carolina. (It’s the 5th oldest operating amusement park in the country and 16th oldest in the world.) It is located on 66 acres adjacent to the original campus of North Carolina State University, just off Western Boulevard. 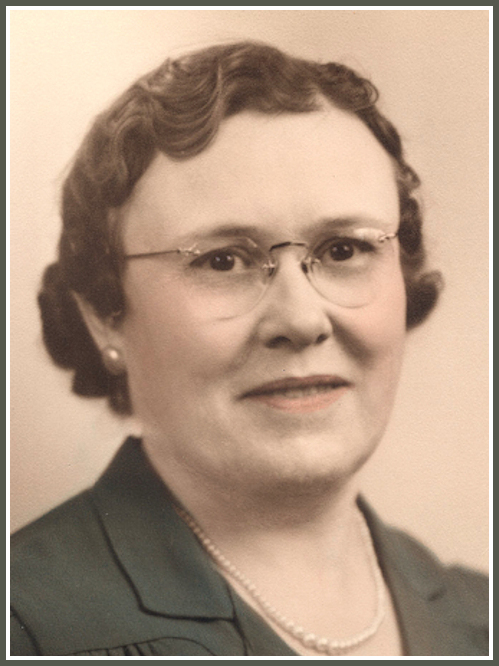 Even though she would not have wanted you to know it, today would have been birthday number 122 for my maternal grandmother — Bertha Gertrude Holland Hooks Edgerton. She was born on 28 August 1896 in the tiny town of Apex in Wake County, NC. She was always known to her children and grandchildren as very sensitive about her age. She would never discuss how old she was, and when grandchildren came along, she absolutely forbade being called “Grandmother.” So the name “Ma-Ma” was adopted, and that’s how we grandchildren all knew her. So sensitive was she about her age that she even let it be known she didn’t wish the year of her birth to be engraved on her tombstone. As such, absent any official or written family records, there was for many years general uncertainty in the family as to when she was actually born. When I finally began the ardent study of my family history, one of the first great finds I made was in the 1900 Census. There, with no ambiguity, it showed that Ma-Ma was born in August 1896. So exactly when did she become coy about her age? The 1900 Census, showing Bertha’s birth date as August 1896. That sensitivity about her age may have started at the time of her marriage to the 22-year-old Bennett Hardy Hooks. On their 1912 marriage license, she gave her age as 18, when she was in fact 16 years old. The official Wake County Marriage Registry shows her age as 16 (which confirms her birth in 1896); so we have to wonder: was that corrected later? When her first child Mary Louise was born, 13 months later, Bertha was asked her age “at last birthday,” and she gave it as 17 (also correct based on the 1900 Census record). However, 2 years after Mary Louise was born, at the birth of Alma, Bertha gave her age as a year older than she really was. By the time Edna Ruth (my mother) was born, 9 years after that, the age she gave was once again correct. Tragically, Bertha was widowed in 1929 by the death of Hardy Hooks at the age of 38. She was alone, 33 years old, with four children ages 4 to 15 to support and with just a sixth-grade education. There was initially some push-back and resentment from Bertha’s children about this “new daddy.” But over time, his sweet demeanor and unconditional love for his new family won everyone’s heart. So to us grandchildren, it was just natural to call this wonderful and loving man Pa-Pa, and in fact we did. Though the last years of her life were beset with myriad debilitating medical issues that forced her into a nursing home, she bore up as well and feistily as she could manage. Ma-Ma lived to be a venerable 95 years old and died in 1991. Tomorrow, my wife and I and two friends will be seated in the Raleigh IMAX Theater in the Marbles Children’s Museum to see the North Carolina premiere of In Saturn’s Rings. The 39-minute documentary is the 12-year project of Greensboro filmmaker Stephen van Vuuren, and the story of its making is every bit as gigantic as the vision of our Universe that he will be showing on the IMAX screen. This film event promises to be an extremely high definition calculation of (beauty + creation) x (science + technology). Even its trailer, as posted on Youtube, is available to be seen in 8K/4320p! (I suspect that those of you who know what that means are sitting there rather impressed at this point.) Based on everything I’ve read about this film, I fully expect to be moved and wowed by it. You should make a strong effort to see it during its short one-week run in Raleigh (or whenever it is shown wherever you live). To see the “Now Playings” and “Coming Soons” click here. In Saturn’s Rings is a groundbreaking giant-screen movie adventure that takes audiences on a space exploration journey of the mind, heart, and spirit, from the Big Bang to the awe-inspiring rings of Saturn. In Saturn’s Rings comprises more than 7.5 million stunning photographs from space, including images from the Hubble telescope and the Cassini-Huygens mission to Saturn. Both the film’s credits and creator van Vuuren are quick to point out that there is absolutely no use of CGI (computer-generated images), 3D modeling, or simulations. What the telescopes and cameras gave us is exactly and entirely what you see. But what about the animation (that is to say, the perceived movement) that is so striking throughout? Van Vuuren credits the use of Multi-Plane Photo Animation, described as a cinematic art form created by Walt Disney Studios to seamlessly join and animate the photos to full motion. You’ll find below a short film clip narrated by Walt Disney himself, which explains the Multi-Plane Animation process. The film’s producers were fortunate enough to get Levar Burton to voice the narration, and the soundtrack features music by composer Pieter Schlosser. In addition, there’s a performance of Barber’s exquisite and appropriately ethereal Adagio for Strings performed by the Greensboro (NC) Symphony Orchestra, under the direction of Dmitry Sitkovetsky. See Below. At the bottom of this article, I have appended active links to four short videos, including the film’s official 2018 trailer. The first two will give you a brief glimpse of the film itself, beginning with a mesmerizing Saturn “flyover” montage, with the Barber Adagio wafting hauntingly throughout. The second clip is the trailer, which excerpts not only visual highlights but also some of Levar Burton’s narration (“This is REAL!“) At the very least, you should take the time to see these two clips; combined they last only a few seconds over 5 minutes. Strong Recommendation: When watching these two videos, click the bottom right button to go “full screen,” and use the gear-like button to set the resolution as high as your screen will allow. Headphones wouldn’t hurt, either. You’ll thank me later. The third video is director van Vuuren’s 17-minute TEDx talk he gave in Greensboro on March 22, 2018, in which he describes the fascinating processes of photo-wrangling and making the film. The last of the videos is a film of Walt Disney explaining the Multi-Plane Photo Animation Process, used by van Vuuren in this film, that the Disney Studio developed to add realism to animation. And finally, there are brief excerpts from what three reviewers have had to say about In Saturn’s Rings. 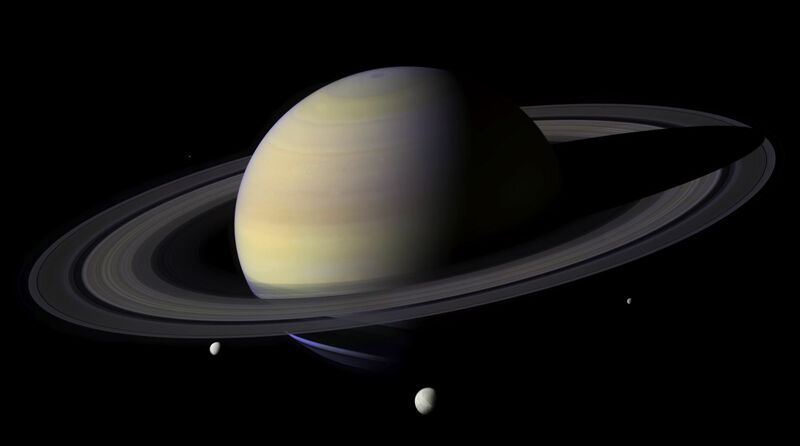 The Movie Elite (Nathan Phillips) — In Saturn’s Rings is a spellbinding documentary with stunning visuals and music that will transport you away for its brisk runtime. It will genuinely transport you to another world; it is a journey into mind, heart, and spirit. I found it very calming to watch, truly breathtaking. Overall, In Saturn’s Rings is a stunning documentary giving us a rare look at one of the most beautiful planets in our galaxy. Even the most ADD-addled brains should find something to enjoy. GeekXPop (Richard Cardenas) — van Vuuren makes his love and respect for the heavens above very apparent in this documentary as the film takes us on a journey from the very beginnings of our universe to what we know of our tiny spec of space in the modern day and how much and how little we know about it all. Stephen van Vuuren brings to the viewer a spectacle of cosmic proportions that explore and analyze what the Cassini-Huygens Mission was able to accomplish during its mission and perfectly encapsulates what he feels with his written words, wonderfully narrated by LeVar Burton, to a degree that I cannot remember experiencing before. One scene in particular in the documentary had me openly weep as a moving collage of images from the Cassini-Huygens Mission were shown in quick succession. I was brought to tears as I marveled at the wonders that the cosmos in our immediate celestial neighborhood provided for us and were brought to life on screen. My Two Cents (Bill Hunt) — In Saturn’s Rings is a large-format look at NASA’s Cassini mission to Saturn, made using over 7.5 million real high-resolution images of the planet, its moons, and other astronomical objects, carefully assembled and presented using classical multi-plane animation techniques. The film is aptly named; some of these images are truly breathtaking, putting you right in the middle of the Saturn system. If you’re a space enthusiast or simply love a good IMAX documentary, the film is well worth a look. You can see my smiling wife Adrianne in this photo, posing with the equally smiling subject of this essay. One of the two people with Adrianne is the guitarist in a rock/progressive rock/jazz trio we had just heard at The Berkeley in downtown Raleigh. (It’s quite a wonderful band, about whom more later!) The other person with her is the ophthalmologist who, less than a week after we moved back to North Carolina, performed emergency retinal laser surgery on Adrianne, thus saving her sight! He has, of course, remained our “eye doctor,” at his practice, the Cary Eye Center. He is someone whom we both genuinely like and immensely respect: an indisputable rock star of the ophthalmic arts. So imagine our surprise when he one day told us about his alter-ego as a true rock star! And, as we first discovered that night at the Berkeley, he’s a truly gifted musician as well. And the reason for this essay today is to invite all who are within a reasonable distance of Grassy Creek, NC (near West Jefferson), to hear Kevin’s band, LowderStill on Saturday, July 21 at The River House Wine Festival. This is a great event involving 10 wineries, live music, craft artisans, and gourmet food from The River House. To find out more about the event, click here. The members of LowderStill stroll down the Midway of the NC State Fair. Shown above are the members of LowderStill (John Teunis, drums; Ted Van Dyk, keyboards; and Kevin O’Neal, guitar) in a publicity still for their upcoming CD, Carnival Show. I’m told they’ll be in the studio finishing it up in July and August, so perhaps we can expect it out in time for holiday gift-giving! Kevin is continuing his musical journey, having now become a solo recording artist, exploring his own genres and compositional styles. His website describes his music as “Jazz/Fusion and Pop,” but I think you’ll hear a silky blend of other influences, as well. In the graphic below is one of his first recordings under his own name. Enjoy! And let me end with a repeat of my invitation to you to attend The River House Wine Festival, this Saturday, July 21. According to the Festival’s website, LowderStill is scheduled to play from 3:30 to 6:00 (closing). Readers of these pages will know that neither of my parents is still living — Daddy having died at age 64 and Mother passing away just days before her 88th birthday. Were they still with us now, Mother would be 93 and Daddy would have celebrated his 100th birthday earlier this year. So, oh my goodness! If they were here, imagine the party we’d be having today!! Rev. G. G. “Uncle Gold” Trevathan on Grover and Ruth’s wedding day. 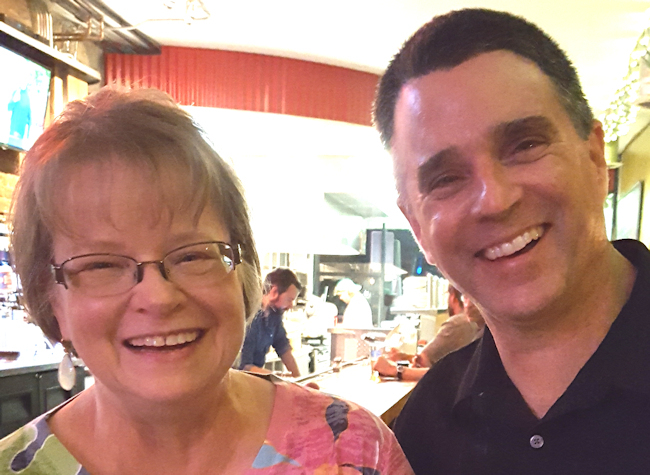 If you haven’t already read them, let me invite you to read the story of their meeting, brief courtship, and wedding day in two articles I wrote in 2012. I learned much more than I had known about that time after having searched and found the lady who was their Flower Girl (and Ring Bearer) in their ceremony. Her name, Janie Proctor, was written in Mother’s handwriting on the back of the copy of the above photo that was in our house all the time I was growing up. I incorporated Janie’s wonderfully memorable stories in these articles: 69 Years Ago and 69 Years Ago — The Sequel: The Flower Girl’s Story. Among the myriad things you’ll learn from those “Flower Girl” articles is that, when Grover and Ruth decided to get married, they visited Grover’s uncle — George Gold Trevathan, a Baptist minister — to ask if he would marry them. He heartily agreed, and offered the use of his home in Pinetops, NC for the ceremony. Both the wedding and a later reception were written up in Raleigh’s The News and Observer, in The Rocky Mount Telegram, and in a local, but otherwise unidentified, newspaper called The Booster. It would not surprise me if I learned that Daddy’s older sister, Ruth Proctor Covert, had written the copy — or even that she had pretty much planned the entire wedding. She was an amazing lady. It’s early on a beautiful North Carolina Sunday morning, July 11, 1943. You’ve dressed in your “Sunday finest,” driven to Pinetops, parked the car as near as you can to the Trevathan residence, and entered the house. 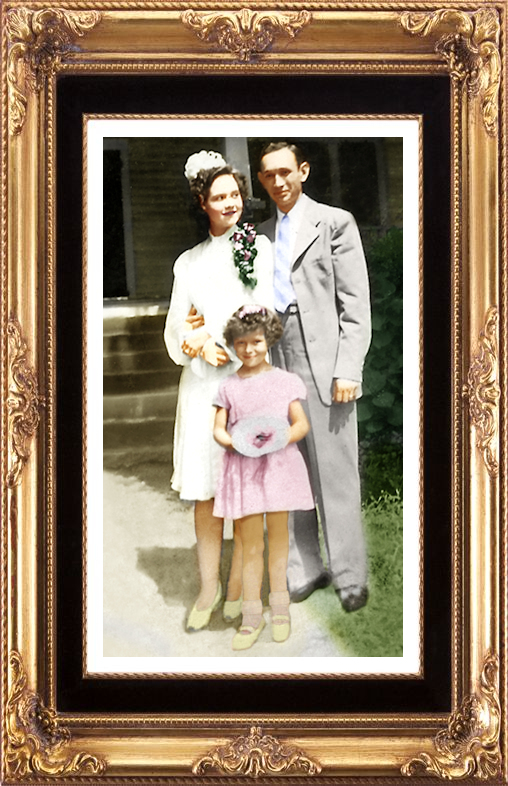 On Sunday morning, July 11th, in Pinetops, Miss Edna Ruth Hooks, of Apex, became the bride of Grover Belmont Proctor. The wedding was solemnized in a quiet and very beautiful ceremony, at 8:30 o’clock at the home of Rev. and Mrs. G. G. Trevathan, uncle and aunt of the bridegroom. Rev. Trevathan, Baptist minister, officiated for the double ring ceremony with relatives of the couple in attendance. Janie Proctor, tiny cousin of the bridegroom, was ring bearer. The vows were taken in the living room at an altar improvised of white flowers and a pair of three branched candelabra holding lighted white tapers, against a background of ferns and ivy. The bride descended the stairs unattended, and there met the bridegroom. They entered the living room together. For her wedding she wore a street-length dress of soft white sheer crepe, a tiny veiled turban, and all white accessories. Her flowers were American Beauty roses and lilies of the valley. The tiny Ringbearer wore a frock of pink taffeta and carried an old-fashioned nosegay of pink and white flowers. After the ceremony, Rev. and Mrs. Trevathan entertained the wedding party and guests at a wedding breakfast. They were assisted by Mrs. V. F. Bullock. The bride and groom later enjoyed a dinner given in their honor by several friends and relatives. Afterwards, they left for a wedding trip to Georgia and Florida, during which time they visited Mrs. Proctor’s brother, James Hooks, U. S. Navy, stationed at Brunswick, Ga., and his wife, the former Miss Lois Pritchett of Petersburg, Virginia. The bride is the attractive daughter of Mr. and Mrs. Harold Edgerton of Apex. She is a native of Apex and was graduated from high school there. She received business training at Apex and is now employed by Rogers Insurance Company. Mr. Proctor, elder son of Mr. and Mrs. Henry Proctor, of Rocky Mount, has spent the greater part of his life in Moncure, where he was graduated from high school. He is connected with the Seaboard Airline Railway Co., in a clerical capacity, now located in Apex. After September 1st the couple will be at home in Apex. 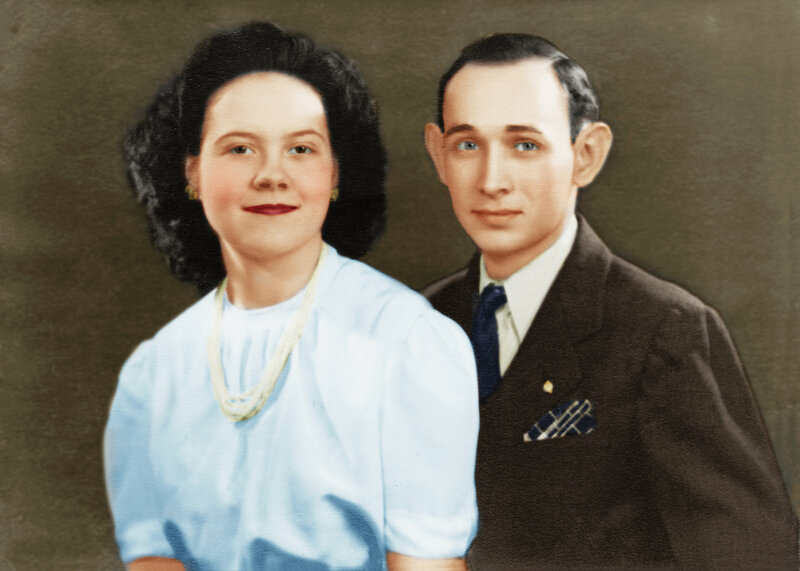 Mr. and Mrs. Henry Proctor, Sr., entertained with a reception at their home in Moncure last Saturday evening, July 17 from 8:30 to 10:30 o’clock, honoring their son, Grover, and his bride, the former Miss Edna Ruth Hooks of Apex. Mr. and Mrs. Henry Proctor were assisted by their daughter, Mrs. Otis Covert. Receiving at the door were Mrs. Covert and Mr. Proctor who presented Mr. and Mrs. Grover Proctor. Mrs. Grover Proctor wore a dress of white chiffon and shoulder corsage. The home was attractively arranged in colorful summer flowers and ferns. The guests were served in the dining room as soon as they arrived. Mrs. T. E. Hinton and Miss Dorothy Mae Burns presided at the punch bowl. Delectable sandwiches and sweets with salted nuts were served on a snow-white tablecloth. In the center of the table was an arrangement of summer flowers. A large number of friends called during the evening. Thank you, dear Reader, for taking this virtual journey with me. Even with the somewhat dated “Social Pages” style of the writing, I can still mentally “see” the events unfolding. So in that sense, I have the rare opportunity of seeing my parents’ wedding, which took place 8 years before I was born! Happy Anniversary, Mother and Daddy. I love you and miss you both so much! Do you mind terribly if we put off that big party I mentioned until we are all reunited again? After all, A Diamond (Anniversary) Is Forever ! Oh my, oh my! This is great news!! I’ve learned that one of the best novels I’ve ever read (and one that I’ve blissfully read 3 times now — 4, if you count listening to the audio book!) has been made into a major motion picture, which will be available on American screens in about five weeks! When my wife Adrianne and I stayed with friends in Dallas a couple of years ago, our hostess purposefully (but silently) left the novel on the bedside table in our guest room. I had failed to bring anything to read on the trip, which was quite unlike me, so I picked up the book. I found the title amusing and the plot summary gently intriguing, so I began reading. I fully intended to read only a few chapters to “unwind” in the evenings and then leave the book back on the table when we departed. But, no! I became almost at once captivated by the story; entranced by a host of endearingly wonderful and beautifully drawn characters; beguiled by the book’s interwoven wit (which occasionally rose to the level of audible-chuckle-inducing humor); and thoroughly enmeshed in the author’s plainly sophisticated, intelligent, lovingly romantic, and warmly charming style. I simply did not want to quit reading, except for frequent pauses to look up, stare into space, and marvel at the glorious writing. The book hugged me all the way through. It is written in epistolary form, meaning that the story is told through the progression of letters and other messages sent between and among the characters. It is a totally daunting form in which to unwind a narrative, but the authors (more about the dual authorship below) seamlessly shift from one persona to the next with graceful ease. They have done it so well that you are quickly able to differentiate the various characters simply by the literary fingerprint of their distinct writing styles. I was not even half finished with the book when it came time for us to travel home. So I took it to our hostess, and with as much of a pleading-puppy-dog look as I could muster said, “Elaine, if I solemnly promise to mail it back to you when I’m done, would you let me take this book with me? I just have to finish it!” She smiled and said that was exactly what she hoped and predicted would happen. Okay, I’ve purposely withheld the name of the book until now, hoping to whet your “literary appetite” to know more. That should be easy, as the title of the novel intriguingly speaks to both literary delights and gustatory imagination. The ten-year-old best-selling and widely loved novel by Mary Ann Shaffer and Annie Barrows, The Guernsey Literary and Potato Peel Pie Society, has been made into a major motion picture, and it will have its American debut on August 10. The story begins in post-war 1946 London, where heroine Juliet Ashton is on a book tour to promote the newly published volume of her wartime essays. Unfortunately, it isn’t going exceedingly well, and Juliet’s heart simply isn’t in it. Guernsey being a book of letters, it isn’t surprising that the next major plot point is when she receives a letter out of the blue from a farmer on the island of Guernsey, introducing himself, and asking what seem to Juliet to be some rather surprising questions about literature. The story unfolds as Juliet learns that, during the war, several of the people of Guernsey formed a “literary society” by accident one night, which proved to be a serendipitous antidote to the island’s German occupation. That’s all I really want to reveal of the plot, because you will prefer it if the rest just unfolds as naturally and beautifully as it does in the book. I mentioned the novel’s dual authorship, which was born of tragedy. After Mary Ann Shaffer (bottom right in photo) had completed her final draft of Guernsey, all that was left was a series of re-writes and edits requested by her editor. But then, unimaginably, Shaffer fell ill and died. This was her first, and therefore only, novel, and the enormity of the “what might have beens” is heart breaking. The grief of losing such a marvelous talent must have been agonizing enough, but what to do about the book? Everybody who had read it surely knew what an amazing document it was. Happily for the sake of literature, her niece Annie Barrows (upper left in photo) was available to step in and finish the work, allowing it therefore to go to press and then out into the world. The Guernsey Literary and Potato Peel Pie Society commemorates beautiful spirits who pass through our midst and hunker undercover through brutal times. Shaffer’s Guernsey characters step from the past radiant with eccentricity and kindly humour, a comic version of the state of grace. They are innocents who have seen and suffered, without allowing evil to penetrate the rind of decency that guards their humanity. Shaffer’s writing, with its delicately offbeat, self-deprecating stylishness, is exquisitely turned, bearing a clear debt to Jane Austen. She shows, in addition, an uncanny ability to evoke period, miming its manners and mannerisms — not only in the reminders of blitzed London but also in recreating a culture that reveres books. Of course, I haven’t seen the film yet — merely two versions of a two-and-a-half-minute trailer (see below). And I’m quite aware that the track record of cinematic adaptations of superior novels is, to put it bluntly, dismal. Nevertheless, I want this movie to be great so much that I am willing to let myself believe that it might actually rise to the literary occasion. It was directed by Mike Newell (Harry Potter and the Goblet of Fire; Four Weddings and a Funeral), so there seems a better-than-even chance of its success. The cast appears to have been well chosen. Juliet is brought to life by Lily James (Downton Abbey; Mamma Mia! 2). Portraying the heroine-author in Guernsey is the second of her “1940’s typewriter roles” — she was Churchill’s at-first terrified secretary in Darkest Hour. The arc of her finely tuned transformation in that role gives great hope for the subtleties that any faithful adaptation of this delicately nuanced book would require. The three male leads, portraying the triumvirate through which Juliet must wind her way towards her final happiness, are (in alphabetical order) Matthew Goode (The Imitation Game; Downton Abbey), Michiel Huisman (Game of Thrones), and Glen Powell (Hidden Figures). The film is something of a mini-reunion for members of the Downton Abbey cast. Lily James (Lady Rose MacClare) and Matthew Goode (Henry Talbot) are joined by Penelope Wilton (Isobel Crawley) and Jessica Brown Findlay (Lady Sybil). The film had its London premiere in April, but it will not reach America until Friday, August 10. And therein lies the one, and so far only, great disappointment for those of us on this side of the pond. All over the rest of the world, they are seeing Guernsey in movie theaters “on the big screen.” But StudioCanal and Blueprint Pictures, the European studios who produced and made the film, sold Guernsey‘s American distribution rights to Netflix — ensuring that the film will not be shown in American movie theaters! What were they thinking?? As a result, apparently the only way we in this country will be able to see the film is streaming over the Internet, and only if you have a Netflix account! I was so looking forward to taking Adrianne to the movies on opening night, treating her to popcorn and a frozen Coke, and holding hands while Juliet walks across the giant silver screen. Phooey! There are, as you may imagine, no reviews from American critics for a movie that hasn’t even shown up here yet. But the reviews that are out there are giving the film a positive, if sometimes guarded and partial, thumbs up. The following is excerpted from an extended review in England’s The Telegraph. A mini-break for the soul! Mike Newell’s adaptation is a film you don’t spend time with so much as spend time in: every location in this irresistible romantic mystery is like a little mini-break for the soul, every costume and piece of set-dressing nibble-ably gorgeous, and every character a pleasure to keep company with, even the rotters. Newell excels as a director of well-picked ensembles — which is why Four Weddings and a Funeral worked as well as it did. Here again, he gives each of his cast members just enough room to stretch: a broad gag here, a hushed monologue there. This kind of magpie detail saves the film’s professed love of the written word from coming off as glib or trite, just as its story-within-a-story — the island’s Nazi occupation — brings a tug or two of gravity to the postwar romantic intrigue. It is a confection in every sense, but plump with natural sweetness. I’ll end here with the film’s official British trailer (which I much prefer to the one fashioned for its American audience by Netflix), and share my hope that you’ll find a way to enjoy the cinematic Guernsey, as we in the Proctor household plan to do. And by all means, if you have not feasted on the book itself, absolutely do not waste time. Go out, get a copy, and start immersing yourself in the unfolding and irresistible delight therein. The film is 124 minutes long. It has not yet been rated by the MPAA. 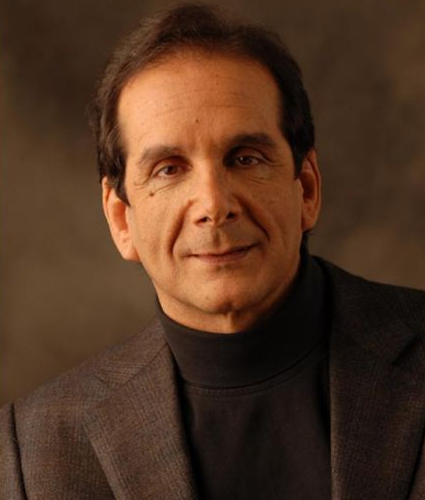 NOTE: This article was originally written and published June 8, 2018, the day that Charles Krauthammer announced to his friends, colleagues, and fans that his fight with cancer was nearing an end. Today, June 21, we learned that he has gone to his rest. 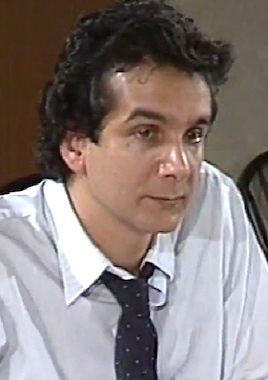 Charles Krauthammer has died of an aggressive cancer at 68 years old. I need to go all the way back to the mind and writings of Christian apologist C.S. Lewis to identify an intelligence and a body of ideas, so cogently and irrefutably expressed, as those of Charles Krauthammer. When he became a regular at 6:00 p.m. on cable television news, I tried never to miss the program. I knew that he would address the complex issues of the day — issues invariably complicated by rascally people (in and out of government) and infused and confused by the injection of small-minded personal invective — and his opinions and solutions would always emerge smoothly and uncomplicatedly brilliant. Even on the rare occasion when I disagreed with his conclusions, the correctness of his logic and the inevitability of the flow of his reasoning were always right on target and thought-generating. His life was full and multi-faceted, evolving in ways one would be hard-pressed to predict. 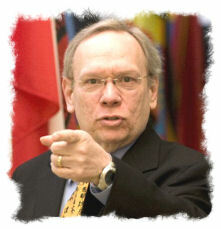 He was, in this chronological order, a Harvard-trained psychiatrist, a political writer for The New Republic, a speechwriter for Walter Mondale, an ardent “Great Society Liberal” (who would, however, become fully disillusioned of modern Progressive Liberalism), a Reagan Conservative, a Pulitzer Prize winner for his commentary in 1987, a diehard Washington Nationals fan, a Conservative political analyst for Fox News, and the author of the best-selling book Things That Matter: Three Decades of Passions, Pastimes and Politics. My wife Adrianne and I got the audiobook of his 2013 book Things That Matter, and listened to it on a long car trip. The book was a revelation, opening the door to give us a much wider and deeper look into the whole man. We find out, as the title promises, what truly matters to him in his life. The following is from the book’s Introduction. God bless you, sir. And thank you for everything. The Washington Post has stated that notes of encouragement and appreciation could be emailed Dr. Krauthammer at THIS ADDRESS. I’m often asked: “How do you go from Walter Mondale to Fox News?” To which the short answer is: “I was young once.” The long answer begins by noting that this is hardly a novel passage. The path is well trodden, most famously by Ronald Reagan, himself once a New Deal Democrat, and more recently by a generation of neoconservatives, lead by Irving Kristol and Norman Podhoretz. Every story has its idiosyncrasies. These are mine. I’d been a lifelong Democrat, and in my youth a Great Society liberal. But I had always identified with the party’s Cold War liberals, uncompromising Truman-Kennedy anti-communists led by the likes of Henry Jackson, Hubert Humphrey and Pat Moynihan. Given my social-democratic political orientation, it was natural for me to work for Democrats, handing out leaflets for Henry Jackson in the 1976 Massachusetts Democratic primary (Jackson won; I handed out a lot of leaflets.) and working for Mondale four years later. After Reagan took office in 1981, however, Democratic foreign policy changed dramatically. Some, of course, had begun their slide toward isolationism years earlier with George McGovern’s “Come Home America” campaign. But the responsibility of governance imposes discipline. When the Soviets provocatively moved Intermediate-range nuclear forces (INF) into Eastern Europe, President Carter and German chancellor Helmut Schmidt got NATO to approve the counter deployment of American INFs in Western Europe. However, as soon as they lost power in 1981, the Democrats did an about-face. They fell in the thrall of the “nuclear freeze,” an idea of unmatched strategic vacuity, which would have canceled the American IMF deployment while freezing the Soviet force in place. The result would have been a major strategic setback, undermining the nuclear guarantee that underwrote the NATO alliance. Years later, leading European social democrats repented their youthful part in the anti-nuclear movement of the early ’80s. But the Democratic Party never did. It went even further left. It reflexively opposed every element of the Reagan foreign policy that ultimately brought total victory in the Cold War: the defense buildup, the resistance to Soviet gains in Central America and the blunt “evil empire” rhetoric that gave hope and succor to dissidents in the gulag. Democrats denounced such talk as provocative and naïve — the pronouncements of “an amiable dunce,” to quote Clark Clifford’s famous phrase disdaining Reagan. And most relevant now, Democrats became implacable foes of missile defense, in large part because the idea originated with Reagan. The resistance was militant and nearly theological. It lasted 30 years — until, well, today, when a Democratic administration, facing North Korean nuclear threats, frantically puts in place (on Guam, in Alaska, in California, and off the Korean coast) the few missile-defense systems that had survived decades of Democratic opposition and defunding. I wrote most of the New Republic editorials opposing the Democratic Party’s foreign policy of retreat, drawing fierce resistance from and occasioning public debate with my more traditionally liberal TNR colleagues. My attack on the nuclear freeze, announced the publisher rather ruefully at the next editorial meeting, produced more canceled subscriptions than any other article in the magazine’s history. At that time, I still saw myself as trying to save the soul of the Democratic Party, which to me meant keeping alive the activist anti-Communist tradition of Truman and Kennedy. But few other Democrats followed. By the mid-1980s, Humphrey and Jackson were dead and Moynihan had declined to pick up their mantle. The Cold War contingent of the Democratic Party essentially disappeared. As someone who had never had any illusions about either communism or Soviet power, I gave up on the Democrats. On foreign policy, as the cliché goes, I didn’t leave the Democratic Party. It left me. Not so on domestic policy. The Democratic Party remained true to itself. I changed. The origin of that evolution is simple: I’m open to empirical evidence. The results of the Great Society experiments started coming in and began showing that, for all its good intentions, the War on Poverty was causing irreparable damage to the very communities it was designed to help. Charles Murray’s Losing Ground was one turning point. Another, more theoretical but equally powerful, was Mancur Olson’s The Rise and Decline of Nations which opened my eyes to the inexorable “institutional sclerosis” that corrodes and corrupts the ever-enlarging welfare state. The ’80s and ’90s saw the further accumulation of a vast body of social science evidence — produced by two generations of critics from James Q. Wilson to Heather McDonald, writing in The Public Interest, City Journal and elsewhere — on the limits and failures of the ever-expanding Leviathan state. Such has been my trajectory. Given my checkered past, I’ve offered this brief personal history for those interested in what forces, internal and external, led me to change direction both vocationally and ideologically. I’ve elaborated it here because I believe that while everyone has the right to change views, one does at least owe others an explanation. The above is mine. This book represents the product of that journey. 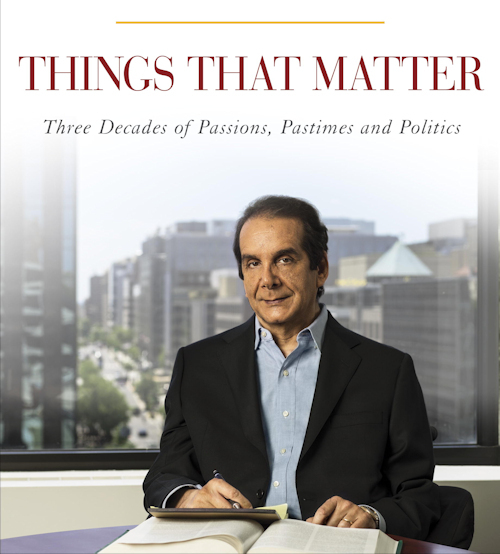 Reprinted from the book Things That Matter: Three Decades of Passions, Pastimes and Politics. Copyright 2013 by Charles Krauthammer. Published by Crown Forum, an imprint of the Crown Publishing Group, a division of Random House LLC, a Penguin Random House Company.